This creamy vegan coleslaw is a summer favorite! It has a super traditional flavor that tastes just like the coleslaw we all know and love – but it’s totally vegan! This vegan slaw is ready in under 5 minutes and in just 3 easy steps! To make the dressing, simply add the vegan mayo, mustard, vinegar, agave nectar, and celery seeds to a medium bowl and whisk together until it’s nice and creamy. The secret sauce to my vegan coleslaw dressing is this homemade, egg free, cashew mayonnaise! It’s the same mayo that I use in my simple potato salad, which is another home run at summer BBQs. I try to cut down on prep work while cooking whenever possible and coleslaw is definitely one of those cases. I always go for a 16 oz store-bought bag of coleslaw mix. That way I can just whisk up the dressing real quick, pour it on my mix, and i’m good to go! If you don’t have a coleslaw mix readily available, it’s super simple to make your own! It just takes some extra work. When making my own mix I use equal parts green and red cabbage and then add some carrots for good measure. If you want a slightly healthier coleslaw try using broccoli slaw instead of a green cabbage mix. Broccoli is more nutritionally dense than green cabbage – just make sure your mix still has red cabbage and carrots. Different colored veggies means different nutrient profiles which is extremely important for a healthy and balanced diet. This creamy vegan coleslaw is the perfect side dish at any picnic or BBQ. Wash it down and keep cool with some refreshing Lemon Cucumber Mint Water – another great addition to any summer get together! Need a dessert to bring to that BBQ as well? I’ve got you covered with this healthy bliss balls recipe – gooey chocolaty goodness packed with healthy whole foods! 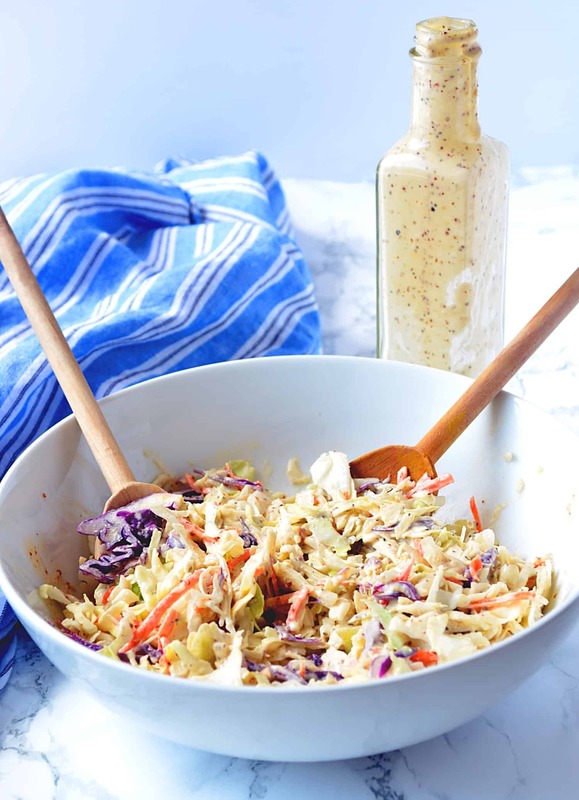 This creamy vegan coleslaw is a summer hit! It’s super easy – done in under 5 minutes and in just 3 simple steps! No dairy, no eggs, totally vegan and totally delicious!